SCIENCE: a way of finding things out and then making them work. Science explains what is happening around us the whole time. So does RELIGION, but science is better because it comes up with more understandable excuses when it's wrong. After five years' work I allowed myself to speculate on the subject, and drew up some short notes; these I enlarged in 1844 into a sketch of the conclusions, which then seemed to me probable: from that period to the present day I have steadily pursued the same object. I hope that I may be excused for entering on these personal details, as I give them to show that I have not been hasty in coming to a decision. From On the Origin of Species by Means of Natural Selection; or, The Preservation of Favoured Races in the Struggle for Life (1861), 9. 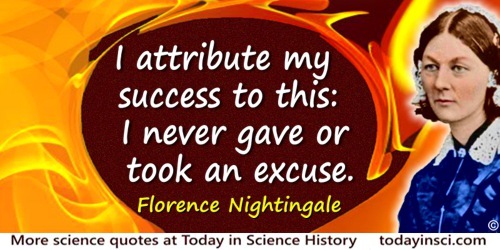 I attribute my success to this:— I never gave or took an excuse. Letter (1861) to Miss H. Bonham Carter, transcribed in Edward Cook, The Life of Florence Nightingale (1913, 1914), Vol. 1, 506. I do see the difference now between me and other men. When a disaster happens, I act and they make excuses. Letter (1861) to Miss H. Bonham Carter, transcribed in Edward Cook, The Life of Florence Nightingale (1913, 1914), Vol. 1, 506. The “disaster” that resulted in this remark was when her dressing-room was flooded by a bad pipe from a water cistern. She had first been given an excuse that it resulted from a frost, but she persisted until the real cause was determined and remedied. Nature has no compassion.… [It] accepts no excuses and the only punishment it knows is death. In Between the Devil and the Dragon: The Best Essays and Aphorisms of Eric Hoffer (1982), 7. People who have read a great deal seldom make great discoveries. I do not say this to excuse laziness, for invention presupposes an extensive contemplation of things on one's own account; one must see for oneself more than let oneself be told. Aphorism 85 in Notebook E (1775-1776), as translated by R.J. Hollingdale in Aphorisms (1990). Reprinted as The Waste Books (2000), 77. Research! A mere excuse for idleness; it has never achieved, and will never achieve any results of the slightest value. As quoted from author’s conversation with Jowett, in Logan Pearsall Smith, Unforgotten Years (1938, 1939), 186-187. The evidence from both approaches, statistical and experimental, does not appear sufficiently significant to me to warrant forsaking the pleasure of smoking. As a matter of fact, if the investigations had been pointed toward some material that I thoroughly dislike, such as parsnips, I still would not feel that evidence of the type presented constituted a reasonable excuse for eliminating the things from my diet. I will still continue to smoke, and if the tobacco companies cease manufacturing their product, I will revert to sweet fern and grape leaves. Introduction in Eric Northrup, Science Looks at Smoking (1957), 34. The fact that nature deals the occasional death blow doesn’t hand us an excuse to imitate it. In Terry Pratchett, Ian Stewart and Jack Cohen, The Science of Discworld (2014), 365. They say that the best weapon is the one you never have to fire. I respectfully disagree. I prefer the weapon you only have to fire once. That’s how Dad did it, that’s how America does it... and it’s worked out pretty well so far. I present to you the newest in Stark Industries’ Freedom line. Find an excuse to let one of these off the chain, and I personally guarantee, the bad guys won’t even wanna come out of their caves. Ladies and gentlemen, for your consideration... the Jericho.